I just want to start by thanking @Kvburton657 who nominated me for this. I am very grateful! I have heard of the Liebster award before and have always wanted to take part so now that I have been nominated I just couldn't be happier, I just love taking part in these sort of things. If you could change any one thing about yourself, what would it be? Probably my current weight, I'm in the process of loosing some unwanted weight so if I could shift that, I'd be pretty happy tbh. Who or what inspires you daily? My son! Looking at him makes me want to do so good in life, I strive daily to better myself and get to where I want to be. What’s your favourite thing to do on a wet Sunday afternoon? I love curling up with my little guy, my other half and my gran in the living room, making a fort with covers and pillows then putting on a great movie. Where is the one place you wish you could teleport to? You can teleport there as many times as you wish, however you can only teleport between your house/flat and that place. My grandpa's house in canada. When did you realise for the first time that you wanted to blog? When I was reading a load of great bloggers posts such as misswestendgirl I just wanted a place where I could write so I grabbed my Micellar water and done a review on it. Why do you regret that one moment of your life and what was it? I regret leaving the house once I found my mum dead, I just couldn't handle it and fled the house. I want to be remembered for being that granny in the family who everyone loves and can go to with their problems. I'm a family orientated gal, so I want to be remembered by my family for being awesome. Cats or dogs or what alternative? What was your favourite childhood song? Ooo this is a tough one! I used to listen to cher "do you belive in life after love" on repeat so I guess you could say that. Who would your 5 dinner party guests be? Kurt Cobain, Jeffrey Dahmer, Helen Keller, Andy warhol, Betty Davis. If someone was visiting your hometown and asked you for advice on one must-do or must-see attraction, what would you suggest? Glasgow tour bus! You can see loads by traveling on the wee bus & it's so fun to do. 1: If you could travel to 3 different places in the next month, where would you pick and why? 2: When it comes to date nights, what's your preferences? 3: 5 Favourite movies and why? 4: Who is your faviourite Disney villain and why? 5: Do you think you will still be blogging in 5 years? 6: Your faviourite childhood cartoon and why? 7: If you could go back to any year you wanted to, which year would it be and why? 8: Where is your favourite place to go out to eat and why? 9: If you could change your name right now, would you and why? 10: What are your faviourite type of blog posts to read? 11: Which one of your blog post's is your faviourite and why? So there you have it! 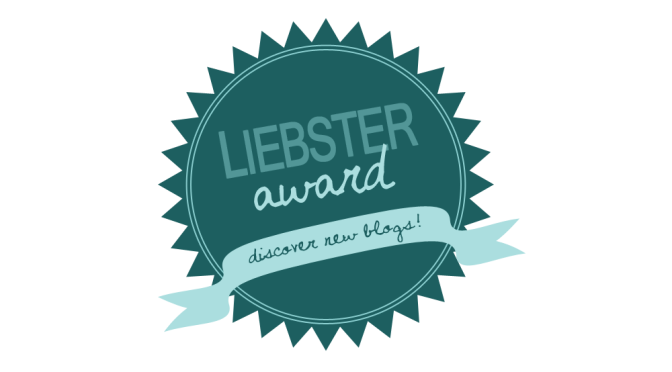 The Liebster Award, I hope you all have fun with it. Once you have done your post be sure to leave me your link so that I can check out your post. I love reading these sort of things, so I can't wait. Thank you so much! I must admit, I'd just love a dinner party with those people! !